Hoyt Wayne Axton (March 25, 1938 – October 26, 1999) was an American folk music singer-songwriter, guitarist, and a film and television actor. He became prominent in the early-1960s, establishing himself on the West Coast as a folk singer with an earthy style and powerful voice. As he matured, some of his songwriting became well known throughout the world. Among them were "Joy to the World", "The Pusher", "No No Song", "Greenback Dollar", "Della and the Dealer", and "Never Been to Spain". Born in Duncan, Oklahoma, Axton spent his pre-teen years in Comanche, Oklahoma, with his brother, John. His mother, Mae Boren Axton, a songwriter, co-wrote the classic rock 'n' roll song "Heartbreak Hotel", which became a major hit for Elvis Presley. Some of Hoyt's own songs were also later recorded by Presley. Axton's father, John Thomas Axton, was a naval officer stationed in Jacksonville, Florida; the family joined him there in 1949. Axton graduated from Robert E. Lee High School in 1956 and left town after Knauer's Hardware Store burned down on graduation night, a prank gone wrong. He attended Oklahoma State University on a scholarship, and he played football for the school, but he left to enlist in the US Navy. After his discharge from the navy, he began singing folk songs in San Francisco nightclubs. In the early-1960s he released his first folk album, The Balladeer (recorded at the Troubadour), which included his song "Greenback Dollar". It became a 1963 hit for The Kingston Trio. In 1966, Axton made his film debut in the movie Smoky playing the role of Fred Denton, the evil brother of actor Fess Parker. In 1979, Axton appeared on the PBS music program Austin City Limits during Season 4. Axton was managed by Martin Pichinson and released numerous albums well into the 1980s. He had many minor hits of his own, such as "Boney Fingers", "When the Morning Comes", and 1979's "Della and the Dealer", as well as "Jealous Man" (the latter two he sang in a guest appearance on the TV sitcom WKRP in Cincinnati). His vocal style featured his distinctive bass-baritone (which later deepened to near-bass) and use of characterization. However, his most lasting contributions were songs made famous by others: "Joy to the World" and "Never Been to Spain" (Three Dog Night); "Greenback Dollar" (Kingston Trio); "The Pusher" and "Snowblind Friend" (Steppenwolf); "No-No Song" (Ringo Starr); and an array of others, covered by singers such as Joan Baez, Arlo Guthrie, BJ Thomas, John Denver, Waylon Jennings, Jonathan Edwards, and Anne Murray. Axton also sang a couple of duets with Linda Ronstadt, including "Lion in Winter" and "When the Morning Comes" (a top 40 country hit). His composition "Joy to the World", as performed by Three Dog Night, was #1 on the charts for six straight weeks in 1971, making it the top hit of the year. He named his record label Jeremiah after the bullfrog mentioned in the song. He sang the jingle "Head For the Mountains" in the Busch Beer commercials in the 1980s (and also "The Ballad of Big Mac", touting McDonald's Big Mac onscreen in a 1969 commercial he filmed for the hamburger franchise). Axton also appeared in a Pizza Hut commercial in 1985, and in a TV ad for FTD Florists with Merlin Olsen in 1989. Axton first appeared on television in a David L. Wolper ABC production of The Story of a Folksinger (1963). He frequently appeared on Hootenanny, hosted by Jack Linkletter during this period. In 1965, he appeared in an episode of Bonanza, then followed with other TV roles over the years. As he matured, Axton specialized in playing good ol' boys on television and in films. His face became well known in the 1970s and 1980s through many TV and film appearances, such as in the movies Liar's Moon (1982) playing poor-but-happy farmer Cecil Duncan who is crushed to death when a stack of metal pipes falls on him, The Black Stallion (1979) as the main character's father, and Gremlins (1984) as the protagonist's father. Axton was married four times; the first three ended in divorce. He had five children. Axton struggled with cocaine addiction and several of his songs, including "The Pusher", "Snowblind Friend", and "No-No Song", partly reflect his negative drug experiences. However, he was a proponent of marijuana use for many years until he and his wife were arrested in February 1997 at their Montana home for possession of approximately 500 g (1.1 lb) of marijuana. His wife later explained that she offered Axton marijuana to relieve his pain and stress following a 1995 stroke. Both were fined and given deferred sentences. Axton never fully recovered from his stroke, and had to use a wheelchair much of the time afterwards. He died at age 61 at his home in Victor, Montana, on October 26, 1999, after suffering two heart attacks in two weeks. On November 1, 2007, Axton and his mother were both inducted posthumously into the Oklahoma Music Hall of Fame in Muskogee, Oklahoma. "The Devil" 86 — — — — Live! "Della and the Dealer" became a minor hit in the U.K. after extensive playing by the British D.J. Terry Wogan on his BBC Radio 2 breakfast program of the time. Kingfish: A Story of Huey P. Long (1995, TV Movie) - Huey P. Long, Sr.
Axton also performed the theme song that plays over the closing credits of the 1975 film Mitchell. Axton also composed and sang the theme song to the short-lived television sitcom Flo. Several songs for the 1977 film Outlaw Blues were composed by Axton and sung by Peter Fonda. The Rousters was a short-lived television sitcom (1983) with Axton as 'Cactus' Jack Slade. The show starred Chad Everett as Wyatt Earp III, the grandson of the legendary Wyatt Earp, and Jim Varney as his dim-witted brother, Evan. In the mid-1990s, Axton was chosen to host and narrate the profile series Life and Times on The Nashville Network, in which a different country music figure was spotlighted each hour. His voice was heard throughout and he was seen on-camera doing the introduction and closing of each show in which he participated. Axton also showed up as the narrator for two documentaries of the Western States 100 Mile Endurance Race in 1982 and 1983 called Desperate Dreams. ^ Roberts, David (2006). British Hit Singles & Albums (19th ed.). London: Guinness World Records, Ltd. p. 34. ISBN 1-904994-10-5. ^ a b c d e f g h Oliver, Myrna (October 27, 1999). "Hoyt Axton, Singer, Character Actor and Hit Songwriter, Dies". Los Angeles Times. Retrieved January 5, 2018. ^ Ankeny, Jason. "Biography: Hoyt Axton". Allmusic.com. Retrieved September 6, 2011. ^ "Hoyt Axton Biography (1938-)". filmreference.com. ^ Cohen, Larry. "North Florida Music Hall of Fame". Larry Cohen Productions. Retrieved January 5, 2018. ^ Hinckley, David (October 27, 1999). 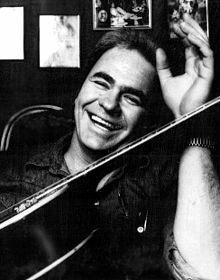 "Songwriter Hoyt Axton Dead At 61 In Montana". New York Daily News. Retrieved September 3, 2011. ^ Burke, Brad (October 27, 1999). "Axton, Hoyt Wayne (1938-1999)". Encyclopedia of Oklahoma History & Culture. Oklahoma Historical Society. Retrieved September 3, 2011. ^ Downing, Jim (November 17, 2007). "Oklahoma Music Hall of Fame Induction 2007". Tulsa Today. Archived from the original on March 18, 2012. Retrieved January 5, 2018. ^ Smoot, D. E. "'Thank God I'm from Oklahoma,' inductee says". Muskogee Phoenix. Muskogee, Oklahoma. Archived from the original on 2012-09-04. Retrieved January 5, 2018. ^ Adams, Greg. "Hoyt Axton: The A&M Years". AllMusic.com. Retrieved January 5, 2018. ^ Whitburn, Joel (2011). Top Pop Singles 1955–2010. Record Research, Inc. p. 50. ISBN 0-89820-188-8. ^ Whitburn, Joel (2005). Joel Whitburn's Top Country Songs, 1944-2005. Record Research Inc. p. 35. ^ "Outlaw Blues (1977) - Overview". TCM.com. Turner Classic Movies. Retrieved January 5, 2018. Allen, Bob. (1998). "Hoyt Axton". In The Encyclopedia of Country Music. Paul Kingsbury, Ed. New York: Oxford University Press. p. 23. "Hoyt Axton". Find a Grave. Retrieved 2008-03-27. "Axton, Hoyt Wayne (1938–1999)". Encyclopedia of Oklahoma History and Culture. Oklahoma Historical Society. Retrieved January 5, 2018.